Rashtrapati Bhavan (Hindi: राष्ट्रपति भवन; Hindi for Presidential House) is the official home of the President of India. As the plan for New Delhi was developed, the Governor-General's residence was given an enormous scale and prominent position. The British architect Edwin Landseer Lutyens, a major member of the city-planning process, was given the primary architectural responsibility. The palace developed very similarly to the original sketches which Lutyens sent Herbert Baker from Simla on June 14, 1912. Lutyens' design is grandly classical overall, with colours and details inspired by Indian architecture. Meanwhile, between 1911 and 1916, 300 families were evicted under the "1894 Land Acquisition Act" from Raisina and Malcha villages, thus clearing about 4,000 acres to begin the construction the Viceroy’s House. Lutyens and Baker who had been assigned to work on the Viceroy's House and the Secretariats, began on friendly terms. Baker had been assigned to work on the two secretariat buildings which were in front of Viceroy's House. The original plan was to have Viceroy's House on the top of Raisina Hill, with the secretariats lower down. It was later decided to build 400 yards back, and put both buildings on top of the plateau. While Lutyens wanted the Viceroy's house to be higher, he was forced to move it back from the intended position, which resulted in a dispute with Baker. After completion, Lutyens argued with Baker, because the view of the front of the building was obscured by the high angle of the road. Lutyens campaigned for its fixing, but was not able to get it to be changed. Lutyens wanted to make a long inclined grade all the way to Viceroy's house with retaining walls on either side. While this would give a view of the house from further back, it would also cut through the square between the secretariat buildings. The committee with Lutyens and Baker established in January 1914 said the grade was to be no steeper than 1 in 25, though it eventually was changed to 1 in 22, a steeper gradient which made it more difficult to see the Viceroy's palace. While Lutyens knew about the gradient, and the possibility that the Viceroy's palace would be obscured by the road, it is thought that Lutyens did not fully realise how little the front of the house would be visible. In 1916 the Imperial Delhi committee dismissed Lutyens's proposal to alter the gradient. Lutyens thought Baker was more concerned with making money and pleasing the government, rather than making a good architectural design. Lutyens travelled between India and England almost every year for twenty years, to work on the building of the Viceroy's house in both countries. 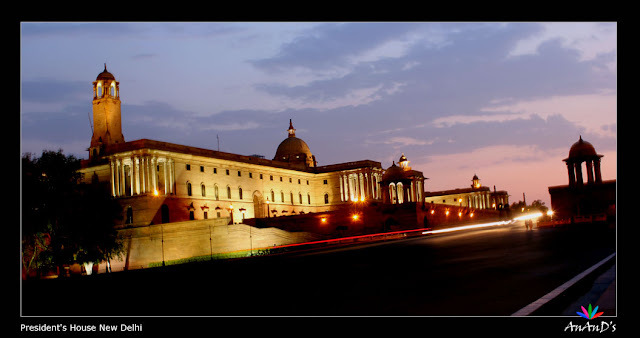 Lutyens had to reduce the building size from 13,000,000 cubic feet (370,000 m3) to 8,500,000 cubic feet (240,000 m3). because of the budget restrictions of Lord Hardinge. While he had demanded that costs be reduced, he nevertheless wanted the house to retain a certain amount of ceremonial grandeur.